September 04, 2018 at 9:24 pm. Clemson coach Dabo Swinney still has nightmarish visions of his first and only trip to Texas A&M for a football game. Swinney was in his second year as a wide receivers coach when the Tigers were bludgeoned by the Aggies 27-6 in 2004. Swinney will find out Saturday night when his No. 2-ranked Tigers visit Kyle Field in College Station, Texas, once again to challenge a Texas A&M team that is hoping to take another step toward prominence under first-year coach Jimbo Fisher. Swinney and Fisher, who was head coach at Florida State the previous eight seasons, will be facing off for a ninth consecutive year. When Fisher was coaching the Seminoles, the teams split their eight meetings, but Clemson won each of the last three. Both teams are 1-0 after opening the season last week with resounding victories against FCS opponents. Clemson dispatched Furman 48-7 while the Aggies rolled past Northwestern State 59-7. Clemson will be the highest-ranked non-conference opponent ever to play at Kyle Field. “It’s a great opportunity for everybody to go out there and perform and show what we can do,” said Texas A&M running back Trayveon Williams, who rushed for 240 yards and three touchdowns against Northwestern State. Williams and the Aggies rushed for 503 yards — the second-highest total in school history — in that game, but yardage will be tougher to come by against a Clemson defense that returned eight starters off last year’s team, including all four starters on its defensive front, each of whom has earned All-America honors of some sort during their career. As if dealing with a veteran Clemson defense wasn’t challenging enough, the Aggies must also deal with an offense loaded with skill and depth. The Tigers’ leading rusher last week was freshman Lin-J Dixon, who’s fourth on the depth chart at running back. Eleven different receivers caught at least one pass last week and two of the team’s three receiving touchdowns came via freshmen. Then there’s the matter of quarterbacks. 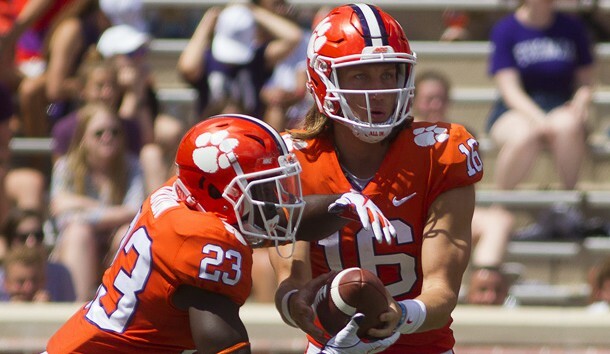 Incumbent Kelly Bryant, who guided Clemson to a 12-2 record and a third consecutive berth in the College Football Playoff last season, started the opener and threw for one score and ran for another, but was upstaged by big-armed freshman Trevor Lawrence, who joined Deshaun Watson as the only two quarterbacks in school history to throw three touchdown passes in their first game. Swinney assured on Tuesday that no one has secured the job long-term and that Bryant and Lawrence will split snaps once again on Saturday. Swinney, meanwhile, has been duly impressed by Texas A&M’s quarterback, Kellen Mond. “He brings a lot of athleticism and I think Jimbo likes that,” Swinney said. “His ability to throw the ball on the run is very impressive. I think he’s matured and there’s a new staff, a new scheme there and there’s confidence that comes with that.